Inspired by the beloved film from Adrienne Shelly and brought to life by a groundbreaking all-female creative team, the Broadway hit Waitress starts serving up treats at the National Theatre in Washington, D.C. With original music and lyrics by Grammy nominee Sara Bareilles ("Brave") and direction from Tony winner Diane Paulus, this is a vibrant tale of a waitress and pie maker who dreams of leaving her small town and loveless marriage. When a baking contest and a new doctor offer a chance at a fresh start, she must summon the strength to build her new life in a play EW calls "a little slice of heaven." "...While it took me awhile to warm up to Desi Oakley as Jenna - she gives a much more consistently internal and understated acting and singing performance than others I've seen in the role - she ultimately embodies a strong, but wounded woman trying to navigate a difficult situation. I wanted her to succeed in the end. Her singing is beautiful, especially on "What Baking Can Do" and "She Used to Be Mine." She can expertly navigate more folksy tunes along with big ballads and her voice fits them all." "...Waitress at the National Theatre is sweet as "Sugar." The word resonates during scene shifts, as an immensely talented piemaker, Jenna (Desi Oakley), lists the ingredients for the new pie she is inventing in the opening number, "What's Inside." The mix of flavors is delicious as Jenna is joined in harmonies by her fellow waitresses, brassy Becky (Charity Angel Dawson) and quirky uber-nerd Dawn (Lenne Klingaman). The band, who are occasionally also onstage, and other singers are uniformly terrific, and do justice to the songs of first-time Broadway composer, and 6-time Grammy nominee, Sara Bareilles." "...With a convivial spark, Desi Oakley lights up the oven and bakes the production to perfection in the protagonistic role of Jenna. Her accent is convincing, her singing voice sublime, and the way she exists within this world of fantasy, memory, and reality, is truly mesmerizing. Showcasing a myriad of emotions and moments of character growth, Oakley gives the character a refreshing life on the stage. Traversing the ups and downs, the laughs and tears, the scary moments and the pleasurable ones, Oakley finds the perfect recipe for making this character extraordinary. Her torch song, “She Used to Be Mine” is a powerhouse breakout filled with raw emotions and vocal prowess, even if it does end on a subtle and soft series of sounds. Remarkable in the role of Jenna, Desi Oakley is as enticing as all of those pies Jenna spends all night baking!" "..."Butter. Sugar. Flour." 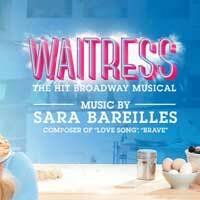 These three words are sprinkled like incantations throughout the 2016 musical Waitress, a tasty, buttermilk tart and bright woman-powered show that features Sara Bareilles' sublime alt-country, contemporary pop music and lyrics and a multi-layered book by Jessie Nelson based on Adrienne Shelly's 2006 indie film of the same name."